The Mitsubishi L200 Barbarian SVP II builds on the success of the original limited edition SVP version and the company says that, like its predecessor, it is instantly recognisable with a striking two-tone colour scheme and significant appearance changes to the exterior and interior. Only 250 will be produced with half available in pearlescent Diamond Black and the other half in metallic Atlantic Grey. Details on either are picked out in orange. On top of the standard specification of the Mitsubishi L200 Barbarian Double Cab, the new special edition adds a host of extras. 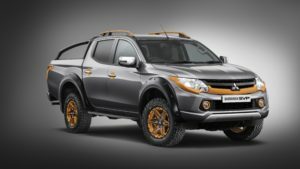 On the outside, the pickup features 17-inch bespoke black and orange alloy wheels with BF Goodrich all-terrain tyres, covered by aggressive wheel arch extensions, together with a new SVP grille and roof rails, both of which are also finished in black and orange. The fog lamp rings, front and rear light bezels, door handle recess covers, puddle lamps and tailgate handle surround are all picked out in orange. SVP tailgate badging, a colour-coded bumper and shark fin-inspired black side steps complete the distinctive look, while for added convenience there are the additions of load bed illumination and a spring-assisted tailgate with soft-opening damper. 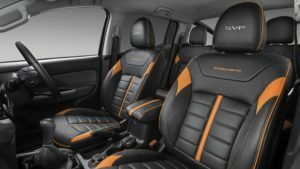 The special colour scheme is carried over into the interior, the Barbarian-inspired ‘six-pack’ leather seats with suede-like ‘Alston’ inserts having orange accented panelling, stitching and piping. Each SVP II’s individual limited edition number, plus the SVP logo, is stitched into the headrests and there’s also an ‘SVP’ embossed mat set with orange piping. The distinctive theme continues with orange illuminated door entry guards and front and rear foot-well mood lighting. Power is provided by an all-aluminium 2.4-litre turbodiesel engine, while the rotary-dial controlled Super Select 4WD system, which allows drivers to seamlessly switch between two- and four-wheel drive at speeds of up to 62 mph on all surfaces, can be combined with a six-speed manual or a five-speed automatic transmission with steering-wheel paddle shifters. The Mitsubishi L200 Barbarian SVP II is available to order now and is priced from £29,830 (excluding VAT) for both grey and black versions.